If you’ve been thinking about ordering meals from Gobble, you’re certainly interested in what it has to offer. As it is a meal kit delivery services, it provides ingredients and recipes; once they arrive at your home, all you have to do is follow the recipes and prepare your meals. Gobble provides lavish yet extremely simple recipes to its customers. What you get once you sign up for Gobble is premium service, high-quality food, and innovative recipes for delicious dishes. Each dinner kit from Gobble features pre-portioned, par-cooked ingredients and an easy-to-follow recipe that helps you cook like a professional chef. All recipes are chef-crafted. You can choose to order for 2 or 4 people for at least two days of the week. However, there’s no limit to the number of meals you can order, meaning you can easily plan to serve a big dinner for your friends and family. Gobble takes care of your health, helping you eat a balanced diet. With Gobble, you always get the finest produce and first-rate meat. Gobble cooperates with trusted farmers and purveyors, who also supply local Michelin-starred restaurants. Before you start ordering from Gobble, you need to note your food preferences and state whether you want to receive exclusively vegetarian meals or prefer eating meat. You can choose the types of meat you prefer too. Unfortunately, Gobble doesn’t have special menus for people with specific dietary needs yet. In case you are on a dairy-free, soy-free or gluten-free diet, you’ll have to check the detailed descriptions of the meals you like before ordering to make sure they don’t contain any allergens. However, it is worth noting that dairy-free, gluten-free, vegetarian, and low-carb meals are available every week. Gobble changes its menu weekly, introducing 24 palatable recipes every week. Each recipe features an in-depth description of the dish, so you can know exactly what you are eating. The menu is divided into 4 sections: From The Range, From The Ranch, From The Sea, and From The Earth. The categorization is based on the main protein source, so you can easily identify meals featuring poultry, red meat, fish and seafood, and the ones focusing on veggies. Each section includes 6 dishes. No matter which category you opt for, you get to enjoy phenomenal dishes such as succulent Wagyu beef Swiss cheeseburger, miso baked cod with Asian vegetable and brown rice, baja fish tacos with pineapple salsa and avocado crema, and honey Dijon chicken with roasted squash. 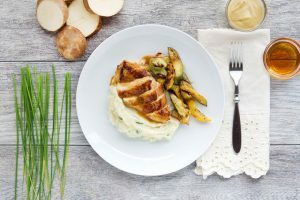 If you have small children, don’t let these innovative recipes discourage you because the Gobble menu also offers meals specially designed for sensitive tummies. Every week, the Gobble menu includes several recipes that are kid-friendly, such as carnitas with tri-color fusilli pasta or barbecue chicken with mac and cheese. You can also easily persuade your kids to eat more veggies since they’re unbelievably delicious when you cook them in accordance with some of the outstanding recipes from Gobble. Try making Bolognese with wild mushrooms, spinach pappardelle, and spring mushrooms and enjoy watching your children lick their plates. Read our informative Gobble review to find out how much Gobble meals costs, where the company delivers, and more. Gobble is a meal kit delivery service that offers par-cooked, pre-portioned ingredients alongside exquisite recipes to transform your tiresome everyday cooking into a joyful experience. 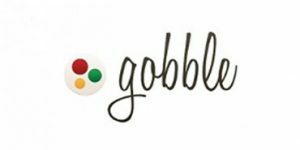 Read our comprehensive Gobble review to learn more about this company’s offer and check out the User Reviews section for useful customer-written Gobble reviews.